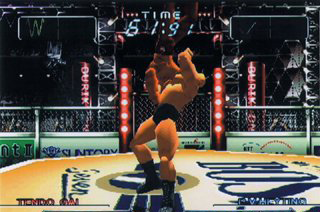 STORY: Known as Buriki One in Tokyo: World Grapple Tournament '99 in Japan... 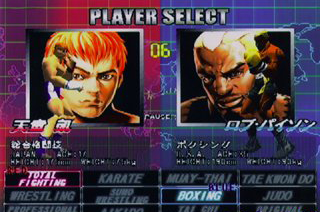 In spring 1999, fighters from across the world gather at the Neo-Tokyo Grapple Dome to compete in the World Grapple Tournament. 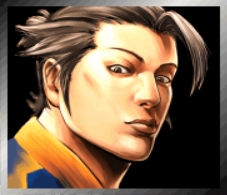 Each contender represents their own fighting discipline, such as Karate, Judo, Boxing, Pro Wrestling, Tae Kwon Do, Tai Chi, Muay Tai, and Sumo. 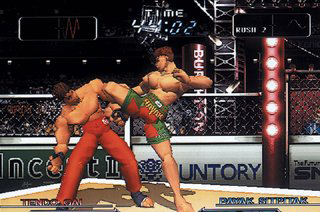 Buriki One is set approximately 15 years after Art of Fighting 3. ABOUT: Buriki One an innovative, yet odd fighting game because it doesn't play much like your traditional 3D (or even 2D) fighter. In fact, the control scheme is pretty much backwards... the control stick (now on the right) is used for attacks, and only two buttons are used for moving around. One button to advance, one to retreat, and hitting both buttons to block. 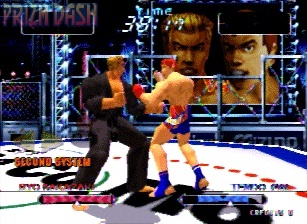 Special moves are done by holding the control stick in a certain direction, and releasing it in the opposite direction. 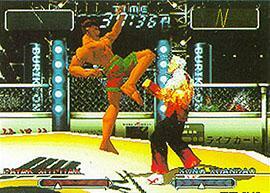 Fighters can also perform counters, ground attacks, and submissions. Also, there are NO life bars... in place of the traditional life bar, you keep your eye on the "heart monitor," and when it turns red... you lose. Buriki One places a lot of emphasis on throwing, grappling, and pins. 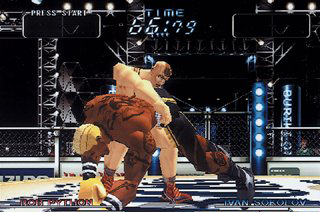 You can get a victory by either knockout, or making your opponent submit via submission hold. 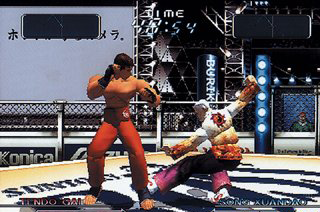 A "balance gauge" is also used to represent the player's center of gravity, showing the direction in which your character may be forced to move. 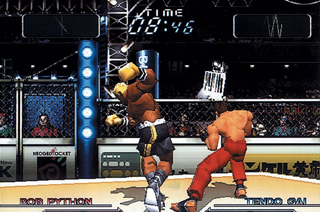 Fights are held in a ring, and if a ring-out occurs, the fighters are set back in the middle of the ring to continue the fight. 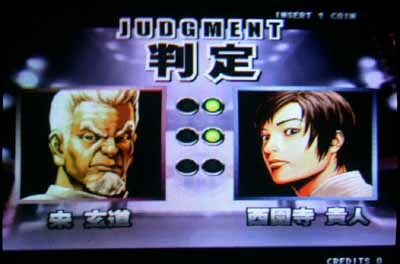 The characters in this game are a fairly good mix... each fighter representing his or her authentic martial art fairly well. Character designs have a more realistic tone, which goes with Buriki One's theme of realism. The game had potential, but the graphics are Buriki One's biggest flaw... boasting blocky, oddly-shaped character models and average animation. While innovative, the gameplay engine of Buriki One didn't turn out nearly as fun or strategic as the traditional 2D/3D fighter. 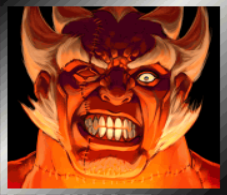 Watch out for that Muay Thai. 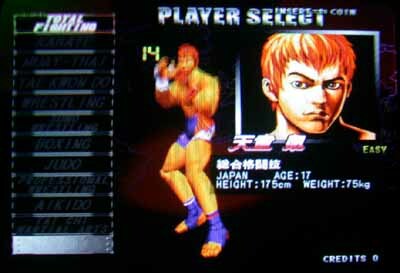 Even when it came out, Buriki One was beyond rare in US arcades. 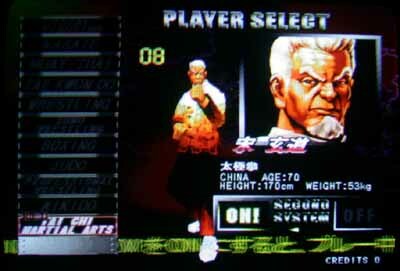 The Hyper Neo Geo 64 never took shape in America, so very few people have actually gotten to play it here in the states. I only "played it" once at an arcade in California, but unfortunately, I found out the arcade stick was broken after I put my money in... so I couldn't even attack. Click Here for all char. portraits!